Amy King (aka 'Boogie') is the owner of Spunky Eclectic, a fiber studio that is both a brick-and-mortar and online store. One of the most dedicated and impassioned of the "younger generations" of handspinners, she has played a significant role in the spinning community for years. Known for her fiber prep and dyeing, she is acclaimed by spinners across the country as well as internationally for her fiber samples and innovative fiber club. The Spunky Eclectic shop is focused on spinning and weaving featuring a wide selection of wheels, spindles, looms, fibers, and handpainted yarns as well as instruction; everything a weaver and spinner needs to get going and keep going. Amy is also the author of the highly received "Spin Control: Techniques for Spinning the Yarn You Want." 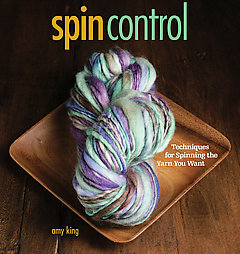 YARN Magazine says, "Amy King is a spinning force to be reckoned with . . . [her book] content is killer for those wanting to take their spinning to the next level." I currently run Spunky Eclectic with my husband, Jay (along with some helping hands from wonderful friends from time to time). We do keep to regular hours but there are times that we're both busy dyeing or running kids around (we home school) so the shop phone sometimes goes unanswered. We will do our best to get back to you in a timely manner. Email is the best method of communication for this reason. Please note that the shop has no regular hours even though we try to be here. Please email or call ahead to see if we're around. Doing so many shows/teachings means regular hours are hard to keep sometimes. Heading North on the turnpike. Turn onto Route 196 towards Lisbon and merge into traffic. Follow Rte 196 into Lisbon, You will come to an intersection of Grazianos and Farwell mill, Take that left over the bridge, go straight, about 1/2 mile up on your right hand side is a big white farmhouse with a pink sign out front. you can park in the long drive, or the parking lot. Handicap access is in the 2nd drive just after the house. Turn left onto Rte 196 heading into Lisbon. Follow Rte 196 into Lisbon, You will come to an intersection of Grazianos and Farwell mill, Take that right and go over the bridge, go straight, about 1/2 mile up on your right hand side is a big white farmhouse with an pink sign out front . You can park in the long drive, or the parking lot. Handicap access is in the 2nd drive just after the house. Turn left onto Rte 9. About 1.5 miles on your left hand side is a big white farmhouse with an invisible sign out front pink sign out front. You can park in the long drive, or the parking lot. Handicap access in this direction is the drive just before the house.